You can sail a considerable part of the ICW - though it takes a fair bit of effort navigating and sailing and having to tack or jibe frequently as parts meander quite a bit. I remember being exhausted when I got to southern Florida and just rested for a few days. My log showed I sailed well over half the distance (no motor). I left NY early in September so I had pretty mild weather. The winds were frequently from the aft quarter, amazingly, so I recall running and reaching quite a bit of it. Much of the waterway is quite open. There was usually reasonable winds and of course the water is mostly flat. I met one 25' sailboat without a motor in Florida and they had sailed (and paddled) the whole way making full use of tides! The winds during Dec to Apr were a big surprise to me. They were much stronger than I had imagined. The winds are a pretty consistent 20-25 knots. All winter I pretty well sailed with a reefed main and a #3 jib - it was all I needed to have the Contessa do full hull speed. The good part of this was the wind was rarely more than 25 knots and also rarely below 15 knots. The Florida Keys are pretty protected and sailing down inside the Bahamas out-islands all the way to Long Island (800+ miles - much further than people realize) are fully protected from the ocean waves so the sailing is idyllic. The water is very warm, and superbly clear, and though going down the Bahamas Island chain is pretty well close hauled the whole way, it is a really fun sail. The anchorages at night are marginally protected should the wind change (very rare) and always in strong tidal currents so one is never truly relaxed - one reason that when you get to major islands, and especially Georgetown on Long Island - you stay for long periods. One thing I remember is that being on a small boat for several months with the wind always whistling through the rigging does get to you a bit (it doesn't die at night like on the Great Lakes) - it was the only thing I would have wanted relief from and I looked forward to the summer for that reason. Spring weather is mostly very pleasant with winds 10 knots to 15 knots. 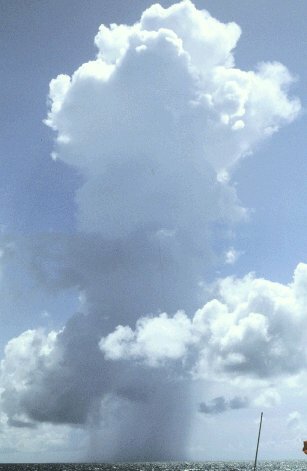 I had some great sailing going up the Bahamas chain on the Atlantic side as the waves were moderate to calm. The only problem were the occasional line squalls or thunderstorms, one a week. They were very severe, much worse than the Great Lakes in summer. Being so far south they packed a huge punch - 90 knot winds for an hour or so. You just kept your eye open and when you see the weather coming just take the sails down and anchor, if somewhere suitable is close by. They can be very scary - see my 'Situations -> Thunderstorm' section. Summer is hot and with light winds most of the time. Unlike the Great Lakes, there is usually enough wind to move at a reasonable speed - 10 knots a good part of the day. I did some fantastic snorkeling on the open Atlantic side of the Bahamas during this time on my way up to the Abacos. The size of the fish and the whole scene below is very different to reefs on the west side of the Bahamas chain. I had to be a bit more wary of sharks but they never seemed to be a threat (though looking back I thing I was a bit naive at the time.) I loved the huge rain clouds which would appear out of no-where and blast rain onto the sea for a few hours, then disappear as silently as they had come. I once sailed right around the edge of one - with rain lashing the water just 50 yards away and my boat dry in the sun. 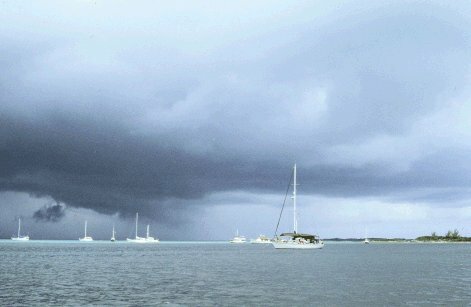 The closest call I had was in a harbour in the Abacos and a thunderstorm drifted through the anchorage at a snail's pace but belted down lightning bolts with a fury. Every mast in a long line got hit, one after the other, and missed mine by just one sailboat. Not much happened to them, that I could see, all the instruments on top of each mast would just vaporize - leaving a puff of brown smoke after the flash - but no other damage was evident and all the boats were still floating the next day.